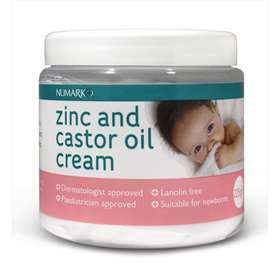 Numark Zinc and Castor Oil Cream 225g to soothe and protect the skin. A protective yet gentle cream that provides a waterproof barrier and soothes the skin. The cream helps to protect delicate baby skin against nappy rash and irritation. Wash the skin gently and dry thoroughly before application. Apply lightly using your fingertips to clean skin as part of your nappy changing routine.